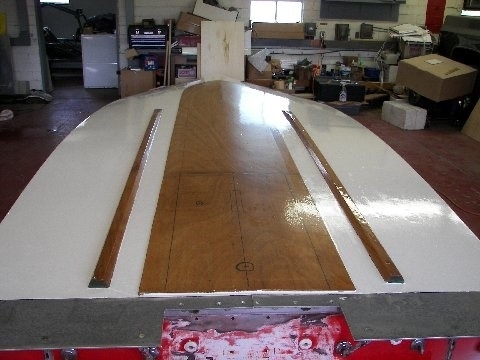 Among the several factors concerning the proper selection of plywood to use in boat work may be the strength and durability required of a panel; bending characteristics and limitations if a panel will be used for other than flat surfaces; how the panel will perform when exposed to such elements as the sun, weather, and moisture; a panel’s ability to maintain sound surface qualities for receiving finishes and sheathings such as fiberglass; its workability, quality, cost, and size required; and finally what may be available. As you can see, choosing a panel to use for your boat can be more involved than simply going down to your local lumberyard and grabbing any panel that may be on sale. 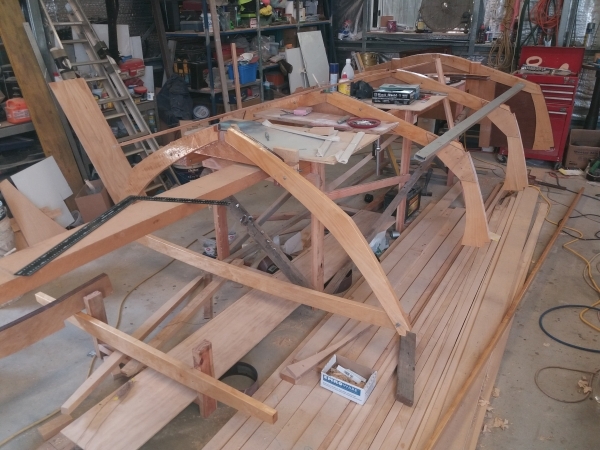 Yet there seems to be a mystique about what sorts of plywood are suitable for boat work, as well as misconceptions; in short, people are often misinformed. 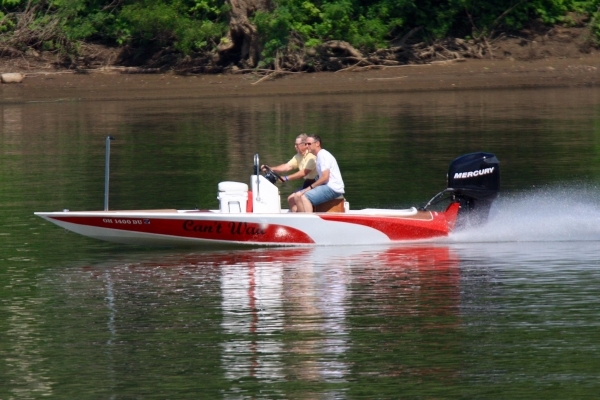 For example, it’s a commonly held belief that only “marine“ grade is suitable for boats. Is this true? And if so, just what is “marine” plywood? In fact, there are really only two broad classifications for plywood; interior, which is largely made with non-waterproof glues, and exterior, which is made from waterproof glues. All other grading, regardless of the type of wood used in the panel, its construction, wood grain orientation, etc., are subordinate to these two basic classes. Since interior-grade plywood (labeled as “INT”) may not be made with waterproof glues, such panels should obviously not be used where constant weather or moisture exposure is a factor. Put more firmly, interior-grade has no place in any boat where structural integrity is critical. 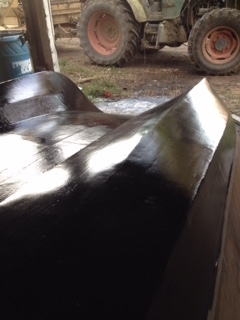 Exterior-grade plywood (labeled as “EXT”), however, will retain its glue bond and structural integrity with repeated exposure to wetting and drying cycles. But what about “marine” grade? Marine-grade plywood (labeled as “MAR”) is actually a special type of exterior ply since the glues used in making both exterior-grade and marine-grade panels are waterproof and probably the same. Both grades (EXT and MAR) will survive being boiled in water for several hours without de-lamination or failure of the glue line, which makes both suitable for exposed use in boats. But what’s the difference between the two and why would you choose one over the other, especially when marine-grade plywood is more costly? Primarily your choice has to do with the soundness and quality of the inner and outer veneers, and how you will use the panel. For example, plywood almost always is made up of an odd number of veneer layers (3, 5, 7, etc.) for the simple reason that the outer veneers should both run in the same direction. However, the inner cores in the exterior-grade panel need not be the same quality or even the same species as the outer plies. Gaps, voids, knotholes, and other defects within the inner cores are quite acceptable under domestic grading standards for exterior-grade panels. With marine-grade panels, however, the inner cores are much higher quality than those of exterior-grade panels, being free of voids and gaps (at least in theory according to the standards), and consisting of inner plies of the same species as the outer veneers (unless stated otherwise which is unusual). If the full length inner plies are not full width, they are jointed for a tight fit. In other words, the inner cores of the marine-grade panel are solid and free of voids. In addition, outer plies of a marine-grade panel tend to be of better quality generally, even if they are rated the same quality as exterior-grade panels. What bearing does the quality of the veneers have to do with your plywood selection? If a panel will be in basically a flat orientation with minimal impact loads perpendicular to the face, an exterior-grade panel will usually suffice. 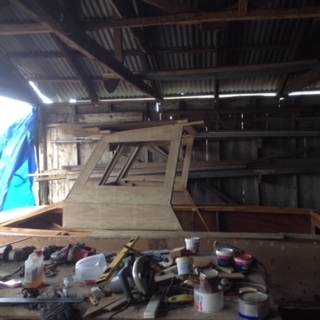 However, where the panel must be bent to conform to curves, and the panel may be subjected to impact loads, such as occur on the planking of a boat especially in the forward bottom areas of the hull, then the marine-grade panel is highly advisable. The reason is simple; if an exterior-grade panel containing voids is used, it is likely to fail in such an application, and often when it is being installed even before ever being exposed to use. 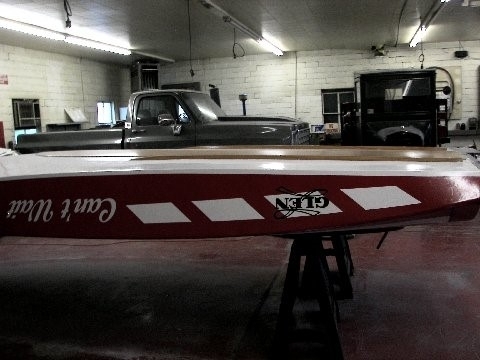 Keep in mind that marine-grade planking is not necessarily mandatory for ALL planking applications in plywood boats, or intended for light-duty use where impact strength is not as critical. Similarly, exterior-grade plywood can usually suffice for bulkheads, cabin sides, and decks on just about any boat, although the marine-grade panel is always superior and denotes a higher standard of quality. In addition to inner veneer quality, face veneers are also graded and used to denote the quality of a panel, usually by a double letter designation such as “A-A” or “A-B”. And “A” face designates an outer layer free of voids or defects, and if veneers are joined on the surface, such joints will be firm and tight. A “B” face (the lowest rating for a marine-grade panel) is similar, but can have certain voids and defects of a limited size which have been factory-plugged or repaired, and the surface need not be quite as smooth. A “C” face (the lowest rating for an exterior-grade panel) may contain open voids and other defects which are not allowed in a marine-grade panel, and the surfaces need not be sanded (*). Exterior-grade is commonly available in face veneer designations of “A-A”, “A-B”, and “A-C”, while marine-grade is either “A-A” or “A-B”. Which should you use? A panel with a “C” face having surface voids, open knotholes, and other defects will be suspect regarding durability, and appearance will be poor if this face is exposed. Therefore, where surface quality is important, and for a panel that will be exposed to the elements, use an “A” or “B” quality face, especially for planking. Quality aside, plywood can be domestic or foreign-made, from several types of wood, with veneers that are usually either plain (flat) sliced, or rotary sliced (around the circumference of the log) which is most common. Plywood with Douglas-fir face and core veneers is commonly available in the U.S. and Canada, and well suited to boat use because of its good strength properties and satisfactory durability. Such material is usually grade-stamped in the U.S. along the edge to show that it meets with voluntary grade standards for member mills of the American Plywood Association. Grading standards of imported panels, however, can vary substantially. In fact, some countries making plywood have no standards and thus no grade-stamp; these panels are best avoided. Other countries, especially in Europe, have grading standards which equal or exceed those of the U.S. These panels tend to be superior both in construction and material quality, and cost more as a result. Imported plywood is commonly made from the various mahoganies (e.g. luan, meranti, khaya, utile, sapele, okoume/gaboon) from such places as the Philippines, Central America, and Africa, in addition to teak ply from the Orient. Where a natural wood grain appearance is desired, these panels are often used. The standard domestic panel is usually 4′ x 8′ in size. However, imported panels are designated in metric dimensions which are similar to our 4′ x 8′ module, but not exactly, and with thicknesses listed in millimeters. Longer panels beyond about 10′ (either domestic or imported) are usually made with factory-made scarf joints which have proven to be quite sound. 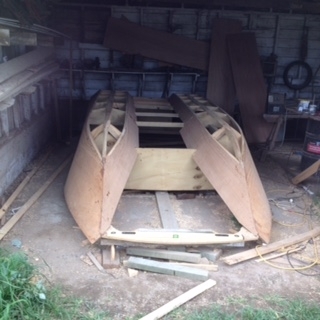 Obtaining suitable plywood for boat work can be difficult, especially if you are remote from major boating centers. While most lumberyards stock the lower grades of exterior ply used in standard shore side construction, finding panels with “A” or “B” faces is more difficult, especially in marine-grade. However, it is common for lumberyards to “special order” such material, if at a premium. If this doesn’t work, let your fingers do the walking through the phone book looking for plywood wholesalers who may refer you to retail sources, or check with local cabinet makers who often have access to better grades of plywood than found at the retail level, and who may be willing to serve you. (*) While sheathing ply such as “CDX” are often thought of as “exterior” grade. They are not rated for constant direct water or weather exposure and should not be used in boats. A lumber measurement. One board foot = 1″ X 12″ X 12″. A piece of lumber 2″ X 12″ X 12″ = 2 board feet. When width and thickness are specified, lumber may be called out as linear feet, i.e., 1″ X 6″ X 24 linear feet. Linear feet is used when the lumber will be cut into various lengths, as opposed to a piece 1″ X 6″ x 24′ which would be a single piece of wood. 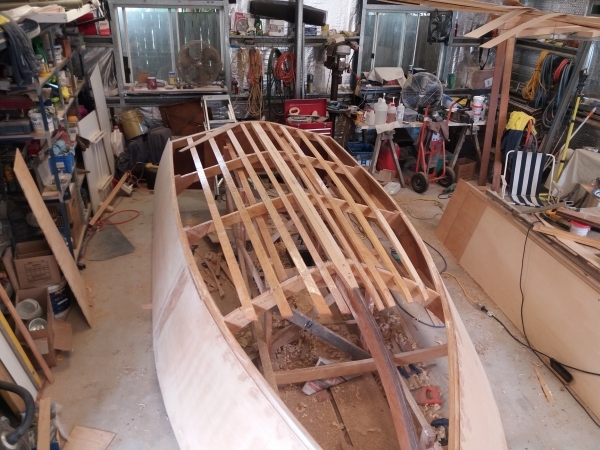 Wondering where to get the lumber and plywood to build your boat? See our List of Lumber Suppliers by State (outside the US also) of suppliers of wood suitable for boat building. We have a Bill of Materials listed online for each boat that we offer and by using this list of suppliers, you can estimate the cost to build your boat. 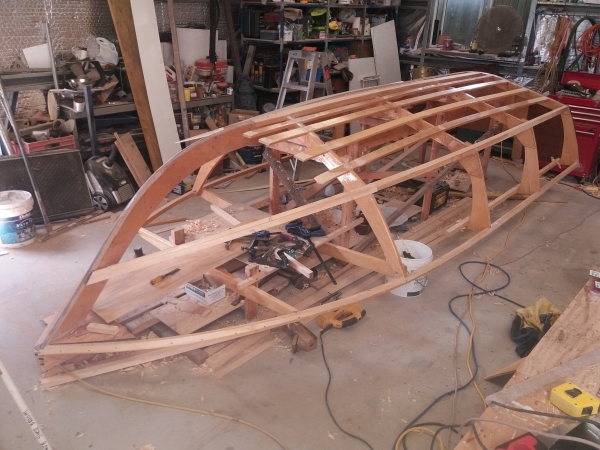 Glen-L marine designs has been serving the amateur boat builder since 1953 and the business resides in beautiful San Clemente, California. My name is Gayle Brantuk and I'm the daughter of Glen L. Witt and run our family business.